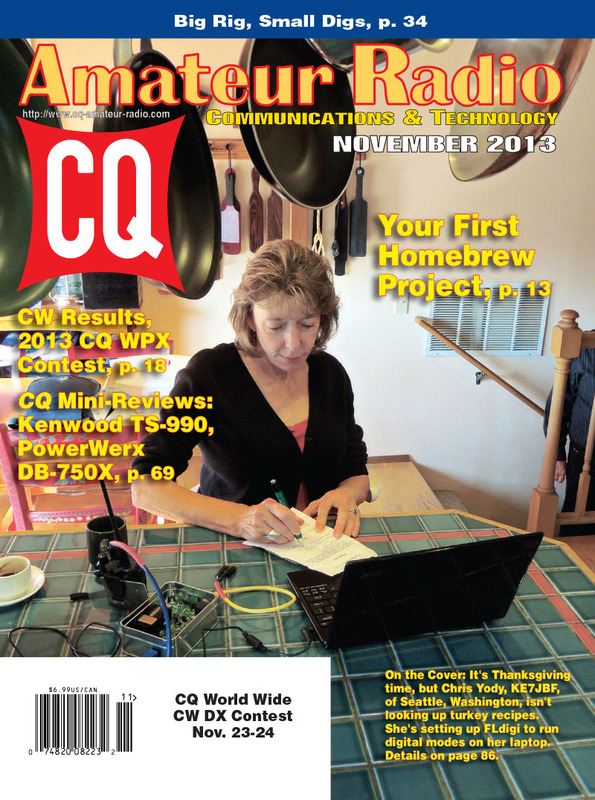 The November issue of CQ begins with an appreciation of former CQ Editor - and later CQ competitor - Wayne Green, W2NSD, founder and publisher of 73 magazine, who became a Silent Key in September, in our "Zero Bias" editorial. A lifelong promoter of building by hams, Wayne probably would have approved of our lead feature, "Ready for Your First Homebrew Project?" by CQ Contributing Editor Richard Fisher, KI6SN. 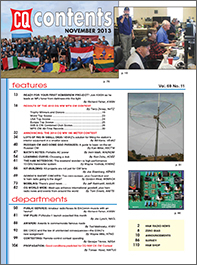 Next, we have the CW results of the 2013 CQ WPX Contest. Complete scores are now available only online. Click here to view. We also have the rules for our first contest of 2014, the CQ World Wide 160-Meter Contest (CW in January, SSB in February). Click here to view. Frequent contributor Bill Karle, VE4KZ, offers his tips on making the most of a small station space in "Lots of Rig in Small Digs;" and Ken Miller, K6CTW, teaches us a little bit of Russian and how to send some basic Russian CW. Among our columns, "Math's Notes" editor Irwin Math, WA2NDM, discusses "Portable AC Power," and Public Service Editor Richard Fisher, KI6SN, takes us way out west … to Hawaii … with a look at how hams in the Aloha State helped rescue a stranded sailor and helped the National Weather Service keep tabs on a tropical storm. 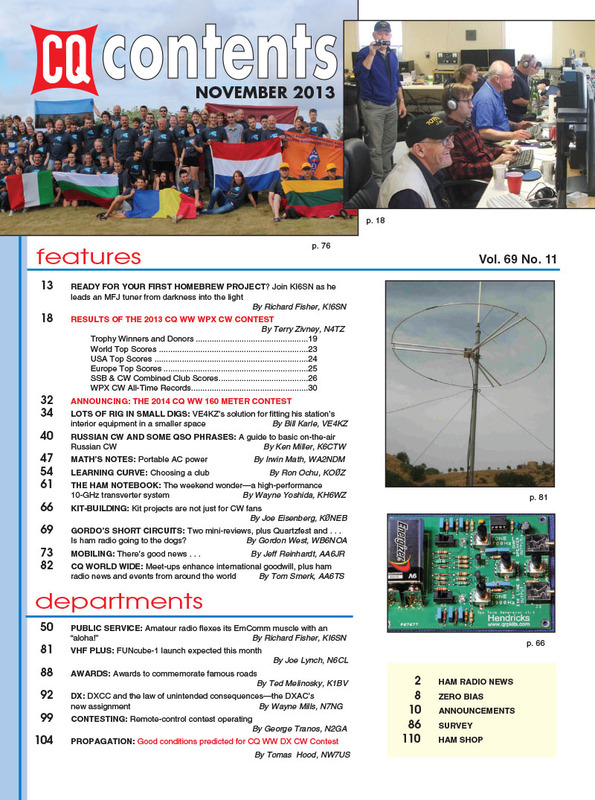 "Learning Curve" editor Ron Ochu, KO0Z, explains the basics of "Choosing a Club;" "Ham Notebook" editor Wayne Yoshida, KH6WZ, introduces us to "The Weekend Wonder: A High Performance 10-GHz Transverter System;" Kit-Building Editor Joe Eisenberg, K0NEB, shows us some kits for SSB transceivers, and Gordon West, WB6NOA, offers two mini-reviews and more in his "Gordo's Short Circuits" column for November. Mobiling Editor Jeff Reinhardt, AA6JR, says there's good news on the mobiling front -- new car sales are up -- and offers hints on working in partial installation of your mobile ham station to your purchase deal. International Editor Tom Smerk, AA6TS, reports on ham radio gatherings that help promote international goodwill; "VHF-Plus" editor Joe Lynch, N6CL, discusses the upcoming launch of "FUNcube-1" and other cubesats; Awards Editor Ted Melinosky, K1BV, checks out awards that commemorate famous roads (including one rail road); DX Editor Wayne Mills, N7NG, offers a commentary on the state of DXCC criteria and the task of redefining them; Contesting Editor George Tranos, N2GA, looks at remote control contesting, and Propagation Editor Tomas Hood, NW7US, predicts good conditions for the 2013 CQWW DX Contest's CW weekend. See Tomas's last-minute forecasts on his website at <http://prop.hfradio.org>. That's a brief look at what's coming up in the November issue of CQ magazine, which should be on newsstands and in subscribers' mailboxes by late October, and available to digital subscribers as of November 1. For information on becoming a CQ subscriber -- to either our print or digital edition -- click on the "Click Here to Subscribe" button at the top of this page. Now available: 2014-2015 CQ Calendars! Click here to order! Zero Bias - "Never Say Die"
On the Cover: Chris Yody, KE7JBF, of Seattle Washington, is not searching for Thanksgiving recipes on her laptop; she's in the process of installing FLdigi and EasyPal digital mode software for her VHF ham station.